Glacier mass balance was introduced in chapter 6. A concerted, global effort to monitor glacier mass balance took root in the 1960s. Annual mass balance data have been gathered for a suite of at least 60 glaciers since 1964 and for at least 90 glaciers since 1981, peaking at 109 glaciers in 1998. Different glaciers have been monitored over this period, with more than 330 glaciers with at least 1 year of data. This is a small fraction of the estimated global population of more than 200,000 glaciers, so most of what is known about glacier mass balance is based on a small subset of glaciers. This is difficult to improve on due to the field-intensive effort required for classical mass balance studies. Extrapolating from the global set of mass balance data and the areal distribution of glaciers, regional, continental, and global glacier changes can be estimated from the early 1960s to the present. Figure 9.3 plots an example of this for the global distribution of small glaciers and ice caps, excluding the polar ice sheets. Figure 9.3. 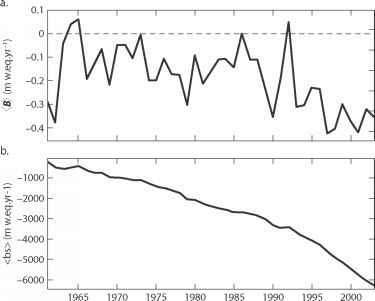 Global glacier mass balance, 1961-2004, excluding the Greenland and Antarctic ice sheets. [From Dyurgerov (2002, updated 2005).] The compilation assumes a global glacier area of 785,000 km2. (a) Mean specific (areally weighted) mass balance rate. (b) Cumulative ice volume change. full period was -0.24 m yr-1 w.e., equivalent to an average rate of global eustatic sea level rise of 0.5 mm yr-1. Glacier contributions to sea level rise have increased markedly since 1990 to an estimated 0.77 mm yr-1 from 1991 to 2004 and more than 1 mm yr-1 in the first decade of the 2000s. The Greenland and Antarctic ice sheets are under intense scrutiny. Both are in a state of negative mass balance at the time of writing, with indications that the two ice sheets are more sensitive to climate warming than previously thought. Satellite altimetry and gravity measurements, airborne radar studies of ice thickness, interferometric synthetic aperture radar (INSAR) measurements of ice motion, and microwave mapping of snow facies and the ice sheet ablation area all inform understanding of mass balance and ice-dynamical processes in each ice sheet. The satellite observations provide an unsettling view of recent changes. Greenland's mass balance has been negative since the early 1990s, after what is believed to be a period of near-balance through much of the 20th century. This is due to a combination of increased surface melting and accelerated ice discharge into the oceans. As a result of these two ablation mechanisms, low altitudes in Greenland have thinned and lost mass since the early 1990s, whereas the interior of the ice sheet, above 2000 m, is near an overall state of balance. Surface mass balance in Greenland is still positive, but regional climate modeling indicates a negative trend in surface mass balance during the past 60 years, with a steepening of melt rates in the 1990s. Recent mass losses due to ice dynamics (calving) and melting in Greenland are similar in magnitude. Greenland is now being carefully monitored to determine whether recent changes reflect a shift to a negative mass balance regime that will persist and perhaps deepen this century or whether the recent extreme years of melting and outlet glacier acceleration may just reflect interannual variability. It is an important and difficult question, as the technology to monitor the ice sheet in detail is relatively new, spanning about two decades, compared with the much longer timescales of many aspects of ice sheet dynamics. Processes in Antarctica have more in common with those in Greenland than glaciologists have traditionally thought. The Antarctic Peninsula warmed dramatically in the 20th century, eliciting glacial retreat and contributing to the breakup of the Wordie Ice Shelf and the Larsen Ice Shelf. Most of West Antarctica has experienced moderate warming since the 1950s, whereas East Antarctic temperatures have been stable or cooling slightly. Because there is little or no surface melting outside of the Antarctica Peninsula, changes in air temperature are of little consequence to most of the ice sheet. Ice shelves are an important exception to this, as it is believed that surface melting can generate through-going crevasses that weaken ice shelves and contribute to their disintegration. There is still negligible surface melting in the major ice shelves of West Antarctica, the Ross and the Ronne-Filchner, but several degrees Celsius of regional warming could threaten these ice shelves through this mechanism. Ocean warming probably poses a more immediate threat in Antarctica, as basal melt rates in ice shelves and floating outlet glaciers reach tens of meters per year. Increased dynamical discharge from the Amundsen Sea sector of West Antarctica since the 1990s appears to have been triggered by regional ocean warming, which has caused thinning of marine-based outlet glaciers, inland grounding line migration, and increased iceberg calving and discharge. Where the ice sheet bed has a reverse slope, as is the case in much of West Antarctica, a classical tidewater glacier instability could cause such ice-marginal perturbations to propagate inland for years to decades, accompanied by regional ice sheet thinning and increased flow velocities. Similar observations and processes apply to several major outlet glaciers of the Greenland ice sheet and have driven the recent increase in dynamical ice losses in Greenland. Increases in high-elevation accumulation are expected to offset partially ice-marginal thinning in both Greenland and Antarctica. Indeed, most climate models forecast that the Antarctic ice sheet will gain mass this century as a result of warming-induced increases in accumulation rate, although it must be emphasized that these models do not include melting at the ice-ocean interface, ice dynamical discharge to the oceans, or potential increases in these sources of ice loss. It is uncertain whether or not snow accumulation has already increased on the Antarctic plateau; available observations are equivocal, but small increases in accumulation may be under way. Whether increases in accumulation occur in a warmer world depends on the degree to which Antarctic precipitation processes are governed by the Clausius-Clapeyron relation versus cyclonic incursions to the interior plateau. Atmospheric modeling indicates that about half of the snow accumulation in East Antarctica occurs through direct deposition of "diamond dust,"
with the other half associated with occasional frontal systems that penetrate to the interior of the ice sheet. 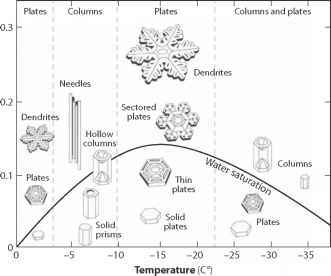 Accumulation of diamond dust is proportional to specific humidity, but precipitation associated with frontal systems is not directly linked with temperature and humidity. Changes in this source of moisture depend on the patterns and frequency of cyclogenesis and storm tracks in the Southern Ocean.